End of a dream or the beginning of reality? 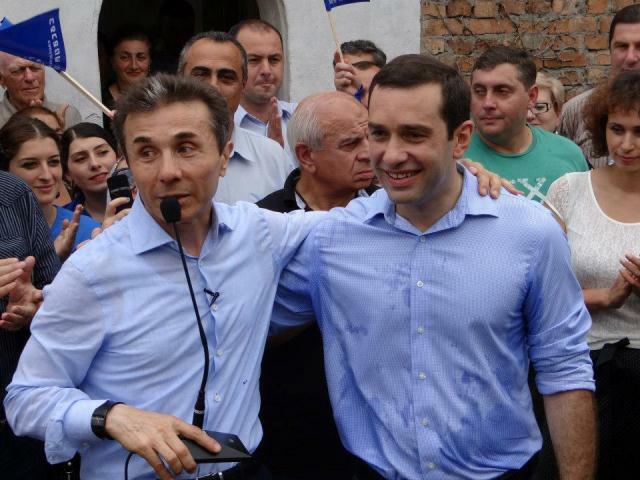 Bidhzina Ivanishvili and Irakli Alasnia campaigning in Zugdidi in August 2012. A terse statement on the website of the government of Georgia on 23 January said that the Prime Minister Bidhzina Ivanishvili had relieved the Defence Minister Irakli Alasania of his other role as First Deputy Prime Minister. The announcement triggered widespread speculation about the reasons for Alasania’s demotion, and of splits in the governing Georgian Dream coalition whose spectacular victory in last year’s autumn parliamentary elections changed the Georgian political landscape. The problem between Ivanishvili and Alasania arose following rumours that Alasania was preparing to present himself as a candidate in the Presidential elections in October and that some of his supporters had already started soliciting support, including from members of other Georgian Dream Coalition parties. Ivanishvili, speaking to Georgian journalists in Davos, said that this had created some problems within the coalition and described this as “Alasania’s small mistake”. Ivanishvili also said that when he recently decided to pay more attention to development of his own party, Georgian Dream-Democratic Georgia, including in the provinces, he in advance informed about it and consulted over it with other parties within the six-party Georgian Dream coalition. There was widespread speculation in the Georgian media about the significance of these developments. Some described them as “the end of a dream”. It had been recognised throughout the election campaign that the coalition was too disparate to be held together, and that it will unravel as soon as the election passes. Indeed this remains a prospect, but for the moment a distant one. Both Ivanishvili and Alasania have sought to downplay the incident and to explain it as part of political reality – normal tension within a coalition. At the heart of the issue however is the personality of Bidhzina Ivanishvili himself. Ivanishvili continues to be underestimated by friend and foe alike. His dealing with Alasania shows once again that he is not a person to take nonsense from anybody. It also confirms that for Ivanishvili’s loyalty is a virtue above all others. Ivanishvili has however to learn that the rules of the political world are similar but not the same as those of the business world. Political support and political legitimacy, are, like loyalty, not easily quantifiable. His government already stands accused of being too narrow based, and there are many elements in Georgia who feel they have been left out, despite the fact that they had also opposed the previous government. If Ivanishvili rocks his own boat too much it may do harm that he will not be able to undo later. However most observers feel that Ivanishvili and Alasania for the moment at least, need each other, and unless there are further complications the issue will pass without much further ado. How the Georgian Dream coalition will deal with the issue of the forthcoming Presidential elections will however be an important test for its long term durability. Positive reaction in international community as Georgia starts historic peaceful transition of power through the ballot box.